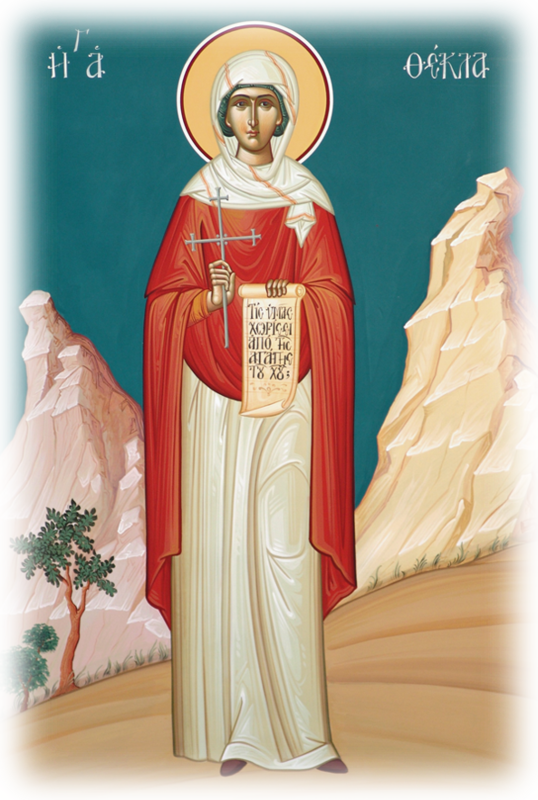 On the twenty-fourth of this month [September], we commemorate the Holy Protomartyr and Equal to the Apostles Thekla. On the twenty fourth a rock received Thekla. 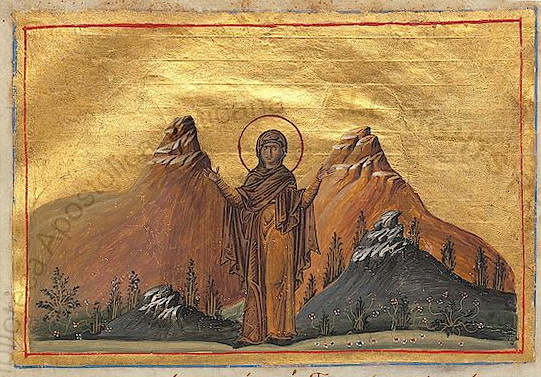 Saint Thekla came from the city of Iconium, the daughter of a noble and distinguished woman named Theokleia, who was a Greek. At the age of eighteen she was engaged to a man named Thamyris. When the Apostle Paul went to Iconium from Antioch, he stayed in the house of Onesiphoros, and there he taught the Christian faith to all who fled to him. At that time the blessed Thekla was sitting in the neighborhood, and heard through the door the sweet words of the blessed Paul, which brought her such enjoyment and longing, that she forgot about food or drink and all the necessities of life. She even forgot about her mother and her fiance, despite the fact that her mother and fiance tried to prevent her from listening to the sweet words of Paul. Thus when Paul was imprisoned, then that renowned woman went by night to the prison, and was nourished by the heavenly teachings of the Apostle, and from that time became his follower. After the both of them stood before the proconsul, Paul was beaten and exiled from the land of Iconium, while Thekla was cast into flames, though through divine grace she remained unharmed. Leaving that place she went in search of the Apostle, and found him hidden in a tomb with his host Onesiphoros, and they went together to Antioch. As soon as they entered the city, one of the main rulers, whose name was Alexander, was smitten with lust for Thekla. After pleading with Paul to take her as his wife, and failing to get what he desired, he unashamedly rushed at her in the middle of the street and began to kiss her. The Saint screamed, tore his coat and threw off the crown he wore on his head, looking only for her spiritual bridegroom Paul. Alexander could not withstand such shame and dishonor, so Thekla was brought before the governor. Hence the Martyr was given for food to a lioness, and then to a lion and bear. After remaining unharmed from the beasts, the Martyr saw a pond full of water. And since she very much desired to be baptized, she entered the water, and the seals that were in the water immediately died by divine power. Then the Maiden was again given to the beasts. The women who were around there yelled out at the governor, speaking out against his unjust treatment of that woman, and they showed great love and kindliness to her. Among these was a relative of Caesar named Tryphaina, who was entrusted from the beginning to protect Thekla, and had Saint Thekla as a daughter instead of her dead daughter Falkonilla. After this the Saint was bound to two fearsome bulls of Alexander. From this also she emerged unharmed. Wherefore because the governor and the ruler Alexander saw that their devices were to no avail, and because they saw the noble Tryphaina faint from the extreme sadness she felt during the torments inflicted on Thekla, out of fear they released the Saint and set her at liberty to live how she wanted. 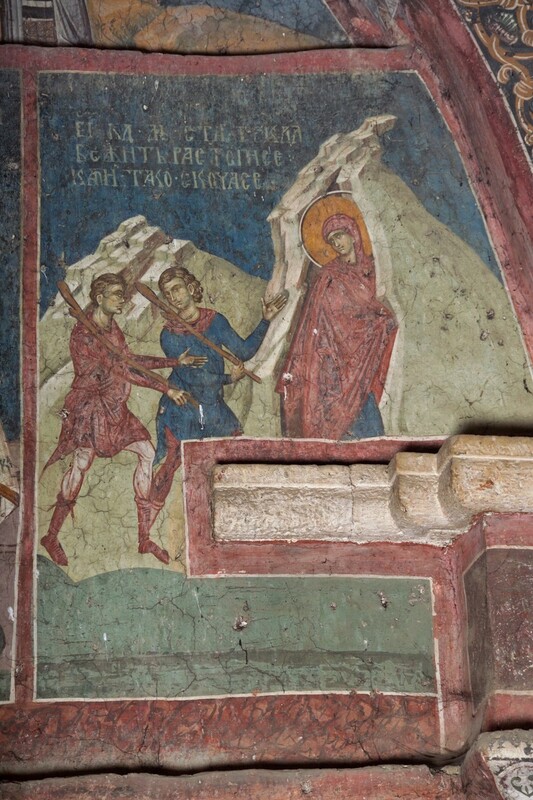 The Saint therefore received her freedom, and after a certain time went to Myra where she met the blessed Paul. From there she returned to Iconium with the favor of the Apostle, and taught the unbelievers there the gospel of Christ. Seeing that her mother according to the flesh was deaf to the words of the gospel, and refused to believe, she left her and Iconium and went to the tomb where she beforehand found the Apostle Paul hidden with Onesiphoros. After venerating and kissing it, she departed for Seleucia. And going outside the city about a Roman mile, she ascended Mount Calamon, and lived in a cave there. There the blessed one underwent many trials from the demons. Having become famous to all, not only for her virtues but also for her miracles, she attracted many noble and rich women to imitate her zeal and asceticism. * It should be noted that the Acts of Paul and Thekla is considered apocryphal by scholars and certain early Fathers, still her life was highly regarded and found to be trustworthy by such Church Fathers as John Chrysostom, Gregory of Nyssa, Epiphanios of Salamis, Cyprian of Carthage, John of Damascus, Jerome, Ambrose, Methodius of Olympus, Gregory the Theologian and others. Her veneration was widespread from the early centuries of Christianity, and a basilica was built around her cave near Seleucia and became a popular place of pilgrimage. Inspired by the divine teacher's words, you were inflamed with love for your Creator. You disdained all earthly pleasures, and endured wild beasts and fire. 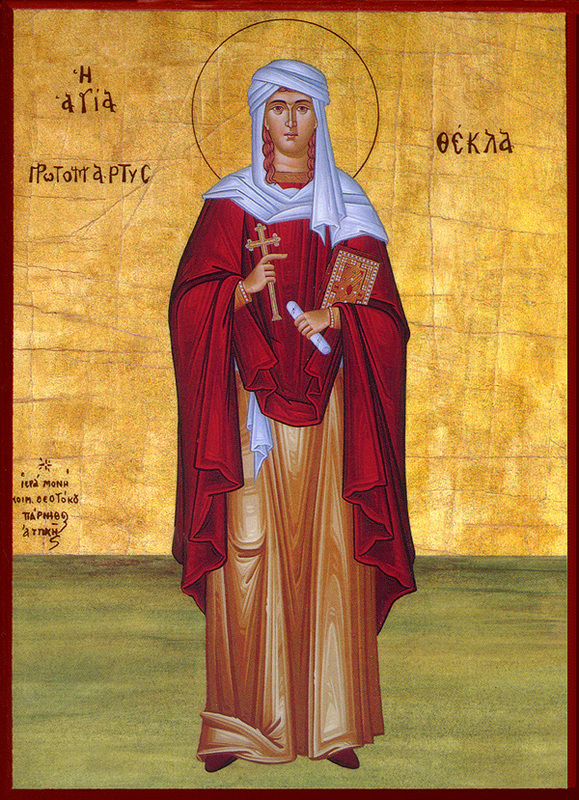 O glorious Thekla, companion of Paul, entreat your divine Bridegroom, to grant us His great mercy. You shone out with the beauty of virginity, you were adorned with a crown of martyrdom, you were entrusted with the work of an apostle, glorious virgin; and you changed the fire’s flame to dew, while by prayer you tamed the raging of the bull as a victorious first Champion. The brilliance of an honored feast brightly outshines the sun; for blazing with beams of light it is mirrored in the eyes of the faithful; therefore as we dance with the Angels, let us all shout aloud to God our Savior, as we cry to him: You have multiplied your mercies, O Savior, by giving a perfect gift to your people: the victorious first Champion.